I'm always glad to return to Curb-world but this felt a lot louder, brasher and extruded than previous seasons. The fatwa bellowing between Jeff and Larry over the phone was like something out of a Seth MacFarlane show. We remarked on noisiness and manufacturedness of the episode and my girlfriend reminded me that Season 8 was much the same. Larry's daughter Cazzie is doing some really great stuff with her web series Eighty-Sixed. Larry David was more confrontational than I remember him in the past. He usually avoided arguments until the other person pressed him. But in this episode, he was initiating fights and egging the other person on. Maybe it's because the fans really like when Larry goes at it over social norms, so we're getting more. Or maybe Larry cares less about being nice after his divorce and getting older. It looked like Larry was arguing for his own amusement. I'm going to keep watching even though this episode didn't make me think a new season was needed. "Palestinian Chicken" in the previous season was the apex of Curb, more than the Seinfeld reunion stuff, and I can't imagine there will be another episode on that level. Well, we finally got those Larry David shower scenes you were all clamoring for. 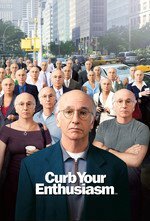 I have loved Curb in the past, but am really on the fence about beginning to watch this season. with the world the way it is, people yelling at each other and being generally boorish and uncivil, even for the sake of laughs, just doesn't seem watchable.